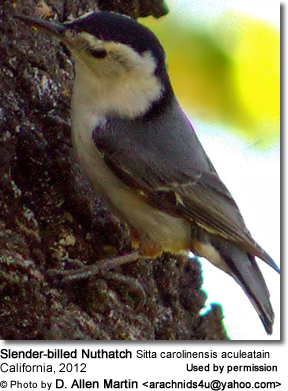 The White-breasted Nuthatches (Sitta carolinensis) - also known as Devil Downheads or Tree Mice - are the largest and most commonly seen members of the nuthatch family. These small songbirds occur naturally in old-growth woodland across much of temperate North America. The estimated average lifespan of this nuthatch is 2 years. 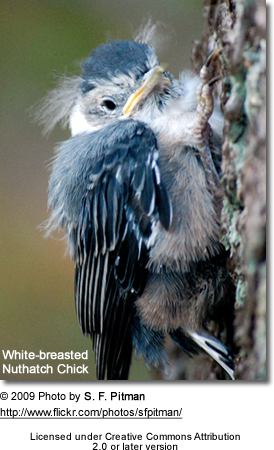 The oldest known White-breasted Nuthatch lived 12 years and 9 months. Adults, young and their eggs are preyed upon by birds of prey (hawks, owls, etc. ), Woodpeckers, reptiles (climbing snakes, such as Serpentes) and mammals. They are one of a few birds who can creep down a tree trunk head first to forage for food or hang upside down, hence their common name "Devil Downheads" (the "Devil" is thought to "turn everything upside-down). The White-breasted Nuthatches also known to exhibit a weird behavior known as "bill sweeping" in which they pick up pieces of fur, plants or insects with their bills and use them to sweep around their nest entrances. Scientists believe they do that to remove their own scents around theirs nests to prevent detection by predators. They are often observed wedging large insects, seeds or nuts into cracks, and then hacking at them with their strong bills to break open the shells or tough outer skins. 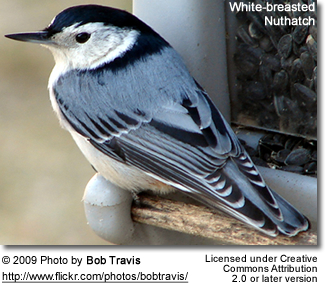 In North America, White-breasted Nuthatches occur naturally in areas with mature forests in the southern regions of Canada, the continental United States to southern Mexico. To a lesser extent they occur in areas without their desired habitats - such as the southeastern United States, the Great Plains and southern Texas. They are vagrants to Vancouver Island (western Canada), Santa Cruz Island (off the Californian coast), and Bermuda (off the east coast of the United States). Adults generally stay in their territory year-round (non-migratory), excepting dispersal due to seed failure (insufficient food supplies) or high reproductive success prompting juveniles to explore new breeding territories. 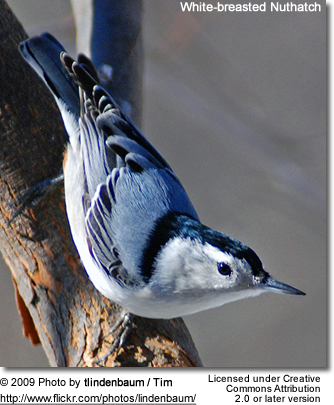 White-breasted Nuthatches are generally associated with mature woods and woodland edges, with emphasis on deciduous stands, such as maple, hickory, basswood and oak, and to a lesser extent in some coniferous forests. In urban settings, they are also found in gardens where they commonly frequent bird feeders..
Eastern populations inhabit open deciduous or mixed hardwood forest, orchards, parks and cemeteries. They are mostly found at lowland elevations, however, in Tennessee breeding occurs at an altitude of 5,500 ft (1,675 m). Those occurring in western parts of their range and in Mexico live in open montane pine-oak woodlands - up to 10,500 ft (3,200 m) in Nevada, California and Mexico. This species is widespread and quite common throughout most of North America with an estimated population of 10 million individuals. Their numbers appear to have increased in the northeast due to regrown forest and maybe due to availability of bird feeders. Some declines have been noted in southeastern United States west to Texas, as well as in Washington. 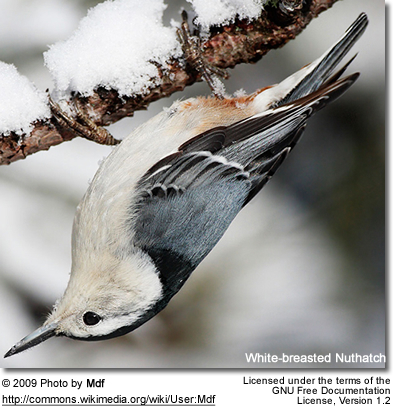 In the three countries where they occur naturally (Canada, the United States and Mexico), the White-breasted Nuthatches are under the protection of the U.S. Migratory Bird Act of 1918. The nine subspecies differ mainly in the color of the body plumage. The upper plumage is darkest in the Rocky Mountains (western interior) and Mexico, turning paler towards the west and the eastern coasts. The eastern forms also have thicker bills and broader dark cap stripes than populations found in the interior or along the Pacific. Different calling patterns have also been noted in some of the subspecies. Range: Central and eastern Canada from central and southern Alberta (south from Lesser Slave L), southeastern Saskatchewan (south and east from Prince Albert), southern Manitoba (south from the Swan River and the City of Winnipeg) and extreme southwestern and southeastern Ontario east to New Brunswick and Nova Scotia (including the islands of Prince Edward and Cape Breton), and south in USA to Gulf Coast and central Florida (east from North Dakota, South Dakota, Nebraska, Kansas, Oklahoma and eastern Texas). Range: From British Columbia (southwestern Canada) and western USA in Cascades of eastern Washington and Oregon, western Montana, western Wyoming, Idaho, central and western Nevada, and eastern California (mostly east of the Sierra Nevada, south to Inyo County). Note: Some lump this form with above ssp. tenuissima. Range: Northern Baja California Norte (Sierra San Pedro Mártir). Range: Western Washington, Oregon and California, and northernmost Baja California. Range: Rocky Mountains - from northern Montana south to eastern Nevada, Utah, Wyoming, west Colorado, Arizona (avoiding the southwestern deserts), western New Mexico, western Oklahoma and Texas (Davis and Guadalupe mountains), and northern Mexico (northeastern Sonora and northwestern Chihuahua). Note: Some authorities lump this ssp. together with above nelsoni. Range: Southwest Texas in the Chisos Mountains and eastern Mexico (northern Sierra Madre Oriental south to western Nuevo León and likely interior southwestern Tamaulipas. Range: Western, central and southern Mexico in Sierra Madre Occidental and associated ranges from southeastern Sonora and central Chihuahua southto Jalisco Michoacán, Hidalgo, Puebla and west central Veracruz (Jalapa, Citlaltepetl Mountains), and southern Sierra Madre Oriental from central Nuevo León (the Gulf slope) and southestern Coahuila south to southwestern Tamaulipas and east San Luis Potosí. Range: Southern Mexico in Guerrero and Oaxaca (Sierra Madre del Sur). ID: Slightly paler back. Females are pale-capped. Mostly identical with nominate form. White-breasted Nuthatches measure between 5 - 6 inches (13 - 15 cm) in length (including the tail) and have a wingspan of 8 - 11 inches ( 20–27 cm). They weigh between 0.64 - 1.06 oz (18–30 g) - the average being about 0.72 oz (20.5 g). These stocky birds have large heads, and short necks, wings and tails. Their legs and strong feet are black. Their black bills are narrow, pointed, slightly upturned and nearly as long as their heads. The back of the nominate male (S. c. carolinensis) is pale blue-grey, with a black band on the upper back and a glossy black or dark grey cap on the head. The color varies in the subspecies, some of which have darker blue-grey backs or greyish backs. The face, throat and chest are white. The plumage below is whitish; with a chestnut wash on the lower abdomen and undertail feathers. The wing coverts and flight feathers are dark grey with paler fringes, and the closed wing is pale grey and black, with a thin white wing bar. The outer tail feathers are black with broad diagonal white bands across the outer three feathers - a feature that is readily visible in flight. Males generally have a brighter plumage than females, which tend to be more grey overall. Females also have narrower black back bands. Their upper parts are slightly duller and the underparts are buffer than those of the males. Females often (but not always) have grey caps (instead of black). However, in the Rocky Mountain, Mexico and the southeastern United States, 40 - 80% of the females have black caps, compared to only 10% of the females in the northeastern United States. Immature birds resemble adults, but are duller plumaged. Red-breasted Nuthatches have black eye lines and reddish underparts. The Pygmy Nuthatch has a brown cap, and a white patch on the nape (back of the neck). .ID: White-breasted Nuthatches can be differentiated from other North American nuthatches by their larger size, the longer bills, and the white on the face that extends all the way around the eyes. 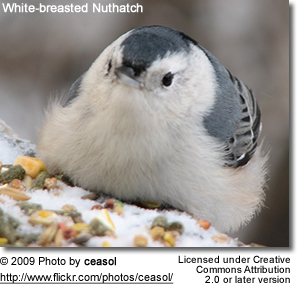 ID: White-breasted Nuthatches have shorter tails and longer, more pointed bills than chickadees or titmice. Brown Creepers have a longer tail and a browner plumage. Juveniles leave the parents' breeding territories and either establish their own territories or become "floaters" (unpaired birds without territories) until they are ready to breed. 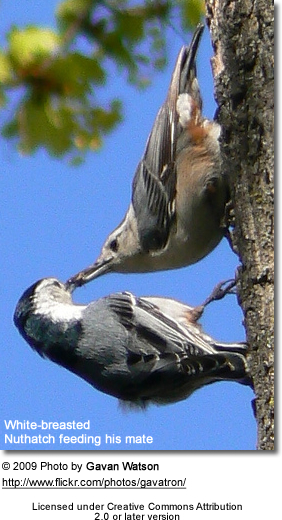 White-breasted Nuthatches reach reproductive maturity when they are about 1 to 1.5 years old, at which time they establish their own breeding territories, which they protect from rivals. Most breeding activities occur from May through early June; though in some areas they may start as early as April and nest until July. At the onset of the breeding season, males sing to attract females and perform by bowing in front them, spreading their tails and dropping their wings while swaying back and forth. Males are frequently observed feeding their female mates. Bonded pairs are monogamous and remain together year-round until one of them perishes. They generally only produce one brood a year; but may replace lost eggs / chicks. The females choose and prepare the nests, which are typically natural cavities in decaying trees situated 10 to 60 feet (~3 to 18 meters) above the ground. 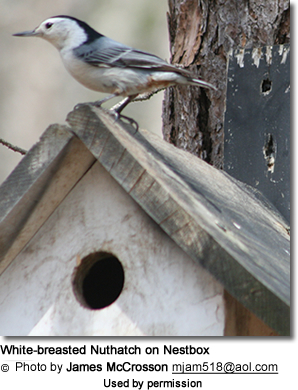 They may also take over abandoned woodpecker nests, or use artificial nest boxes of appropriate size, such as those provided for Eastern Bluebirds. Their nests are lined with fur, feathers, down, soft plant material (such as fine grasses), and shredded bark. 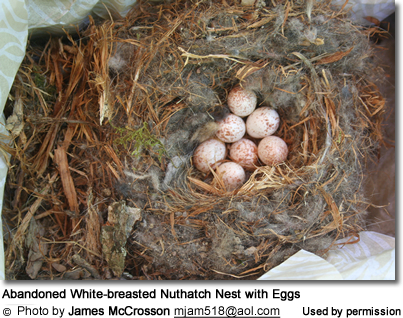 A clutch consists of 3 to 10 (typically 6 to 8) creamy white eggs that measure about 0.75 x 0.55 inches (19 x 14 mm). The eggs are incubated by the females for about 12 - 14 days to hatching, while the males take food to the brooding females, Both parents feed and protect the young, which remain in the nest for 18 - 26 days. The young stay with their parents for several weeks after fledging before dispersing. Breeding pairs often smear insects (such as blister beetles) or pieces of fur or vegetation, around the entrance of the nests to cover up their own scent, which offers some protection against predators that use smell to find their nests. The unpleasant smell of insects is also said to deter squirrels - the main competitors for natural tree cavities. 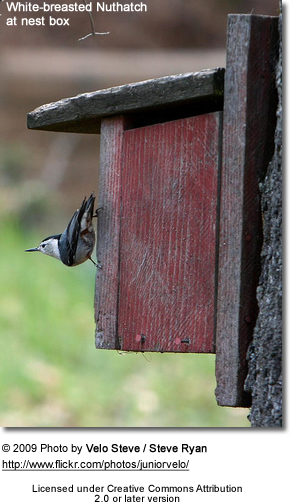 If predators do approach their nests, White-breasted Nuthatches respond by pecking and flicking their wings while making shrill "hn-hn" noises. 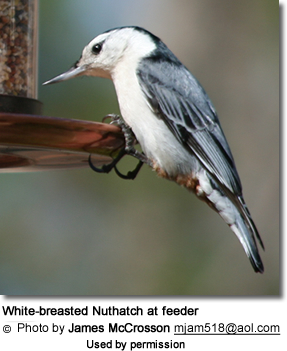 The most important food item for White-breasted Nuthatches is insects; however in fall and winter, they will also eat seeds, grains and nuts. During the summer (the breeding season), they need more protein to raise their families - plus insects are readily available during this time, so they will eat insects almost exclusively (more or less 100%). After the breeding season, in fall, they will eat about 48% seeds / grains / nuts; and in winter, when insects are not as readily available, their diet will consist of about 68% seeds / grains / nuts and the rest insects. The insects eaten include ants, pine weevils, spiders, plant lice, tent caterpillars, scale insects, psyllids, wood borers and leaf beetles. 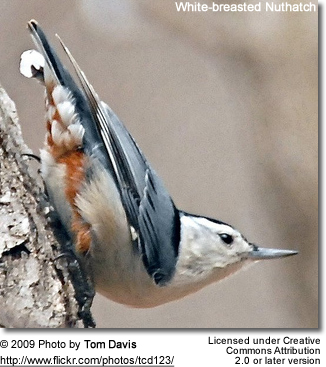 Insects are often taken from trunks and branches; and these nuthatches are often observed creeping up and down the sides of trees as they seek insects or small seeds hidden in crevices along the trunks and limbs of trees. They will also feed on the ground, hopping rather than walking. They are also common at bird feeders where they feed on suet, assorted seeds (particularly favoring black oil sunflower seeds) and nuts. Shelled nuts and larger food items are wedged into the crevices in a tree's bark, hammered and pried open with their strong beaks. They customarily store excess food items - such as peanuts, acorns or hickory nuts - in the cracks and crannies of tree bark for retrieval at a later date (such as during the winter, when food isn't as readily available). A suitable habitat contains mature oak and pine trees to provide food year-round. The White-breasted Nuthatches have loud voices and their nasal yammerings are heard over a distance. They are most vocal during the very early spring and the winter, and mostly for territorial defense and assertion. During the summer (and their breeding season) - they are generally quiet, probably because they want to avoid attracting attention to their nests.. They use a variety of calls and songs, such as a soft, slow buzz and a rapid, two-second chatter, such as Hit and tuck, Tchup, Quank, Quank quank, rapid quank, rough quank, Chrr, Phee-oo, Squeal, Brr-a and Whine. Each call has a different purpose. One of their vocalizations consists of nasal, rapid “wa-wa-wa-wa-wa”. When alarmed they will emit shrill kri vocalizations repeated rapidly with mounting anxiety or excitement kri-kri-kri-kri-kri-kri-kri-kri. Populations occurring in Rocky Mountains and Great Basin tend to emit higher, faster yididitititit sounds, and those found along the Pacific a more nasal beeerf. The males' mating songs are a rapid nasal qui-qui-qui-qui-qui-qui-qui. The contact call between breeding pairs is described as a thin squeaky nit, uttered up to 30 times a minute.